Sunrise Lane offers free delivery in Lower-Mid Manhattan with minimum order of $25. Place your order and then call us at 212-242-7014 to arrange delivery. Your order receipt will show shipping charges but you will be notified by e-mail of correct total without shipping charges. We offer free delivery but we do not pick up returned items. Returned merchandise can be hand delivered or shipped within 10 business days to Sunrise Lane 780 Greenwich Street New York, NY 10014. Please call us before returning any merchandise at 212-242-7014. We're trying to lessen our footprint. At Sunrise Lane, we are committed to reducing our impact on the earth's resources. 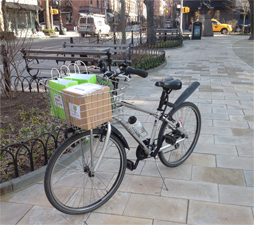 All local deliveries are made by bike.